But when spring is officially here to stay, I’ll need to restock my supply of tanning lotion, since my legs have been hiding under leggings and boots for the last five months, and I don’t want to blind anyone with their shocking paleness. This cake, though, welcomes spring with open arms. 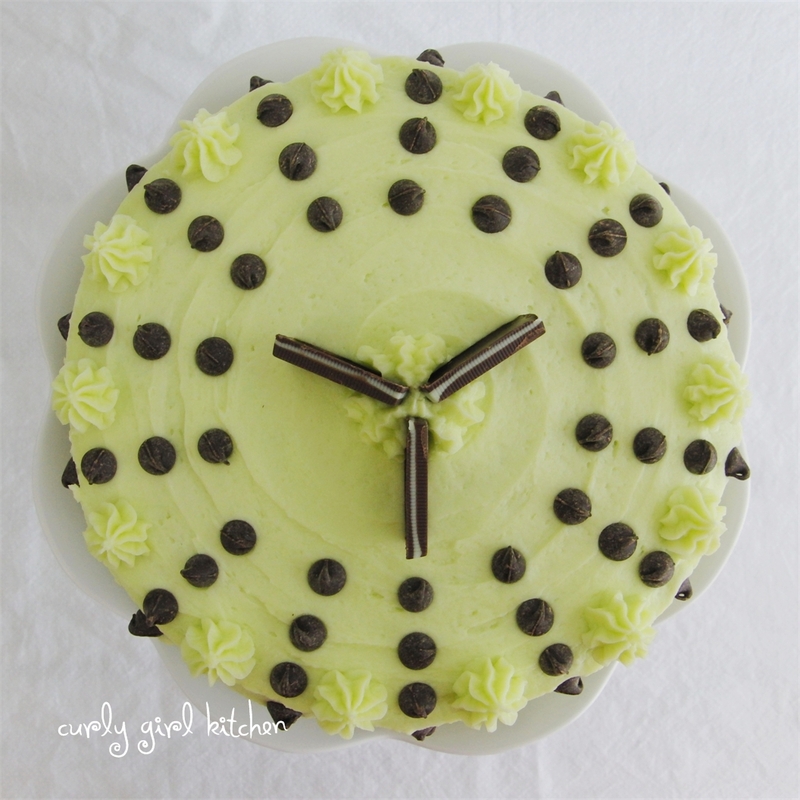 Mint green and chocolate polka dots - what's not to love? 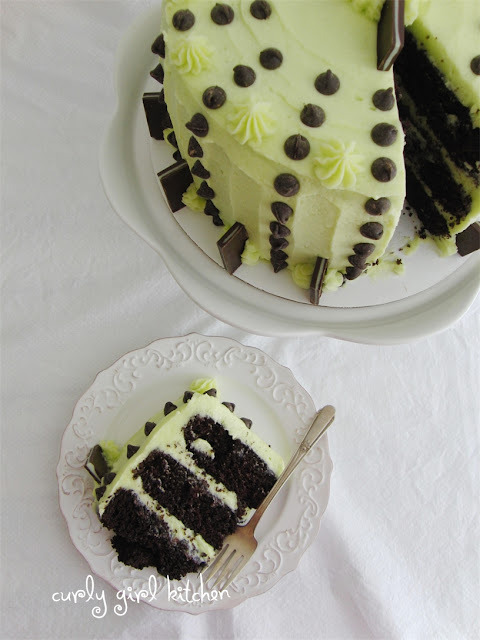 I adore wearing polka dots, so I loved the idea of dressing a cake in them, too. 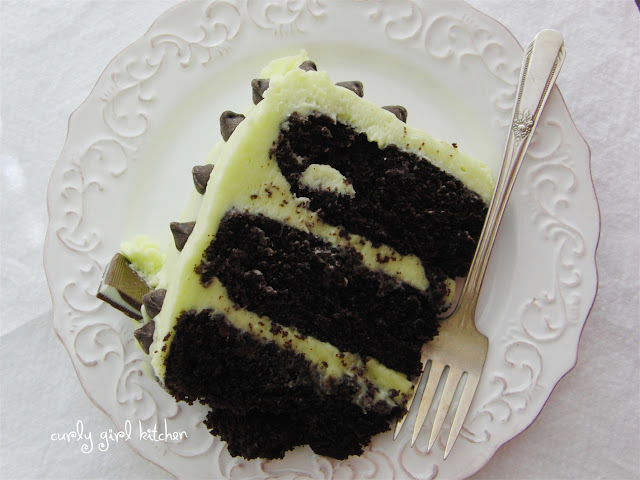 I haven’t baked a layer cake in a few months, so on Sunday, I baked three layers of my favorite, dark chocolate, from-scratch cake and frosted them with cool and creamy, minty buttercream that I made with fresh mint steeped in hot milk. Since most people would mix the chocolate chips or chopped chocolate right into the frosting, I thought a playful way to incorporate the chocolate chips would be with rows of chocolate chip polka dots on the outside of the cake (there are also some chocolate chips baked into the cake, as well). And a few Andes Mints complemented the theme of the cake. I took the cake to work on Monday and it seemed to be the perfect antidote to anyone's lingering St Patrick’s Day hangovers. My coworkers must have liked it, because it was more than half gone before lunchtime! Preheat the oven to 350. Prepare three 8-inch round cake pans by spraying the bottoms only with non-stick spray. Line the bottom with parchment paper, then spray the paper with the non-stick spray. Set aside. In the bowl of your electric mixer, combine the flour, sugar, cocoa, baking soda, baking powder and salt. Add the eggs, milk, oil and vanilla. Mix on low speed for 30 seconds to combine then beat for three minutes on medium speed. Scrape the bowl down and gently stir in the boiling water - the batter will be very thin. Divide batter between the cake pans. Sprinkle the chocolate chips over the batter (the batter is so thin that if you mix them into the batter, they’ll just sink to the bottom of the mixing bowl and not get divided evenly between the pans). Bake for 25-28 minutes until the center of each cake springs back when gently touched and a toothpick comes out clean. Set the pans on wire racks and cover loosely with a clean kitchen towel. Cool completely in the pans. Place the mint leaves in a small saucepan and pour in the milk. Bring to a simmer over medium heat, then remove from the heat, cover and let steep for 1 hour. Strain the milk and discard the mint leaves. Set milk in the refrigerator until ready to use. In the bowl of your stand mixer fitted with the whisk attachment, beat the butter for 1 minute to loosen it up. In a separate bowl, combine the powdered sugar and meringue powder. Gradually add the sugar to the butter, mixing on low to combine. 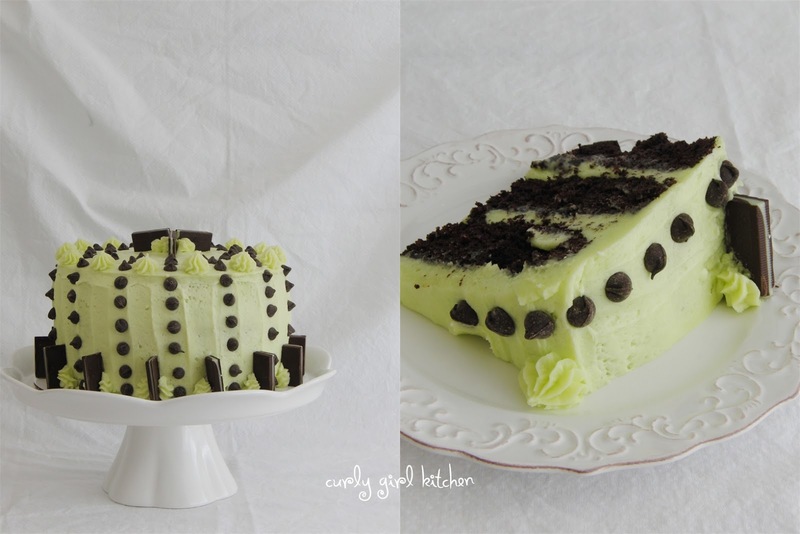 Add the vanilla, the mint-infused milk and the green food coloring. Increase speed to medium high and whip for 4-5 minutes until very light and fluffy. 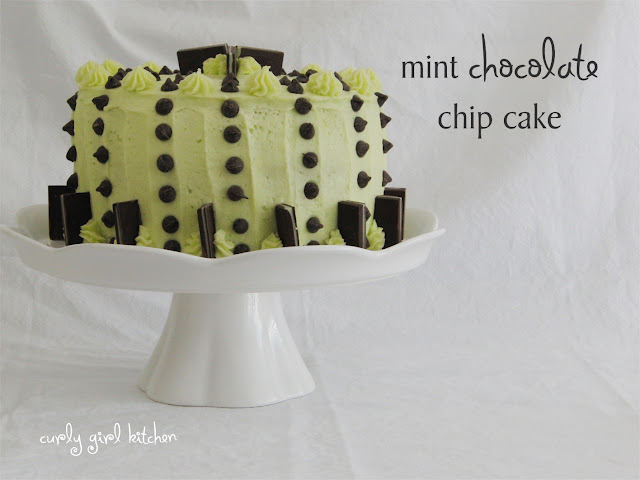 If needed, add more milk to reach the desired consistency for spreading and/or piping, and add a few drops of mint extract if the mint flavor is too subtle. When the cakes are completely cool, turn out of the pans and peel off the parchment paper. Frost each cake layer then cover with a thin crumb coat of buttercream before frosting with the final layer of buttercream. 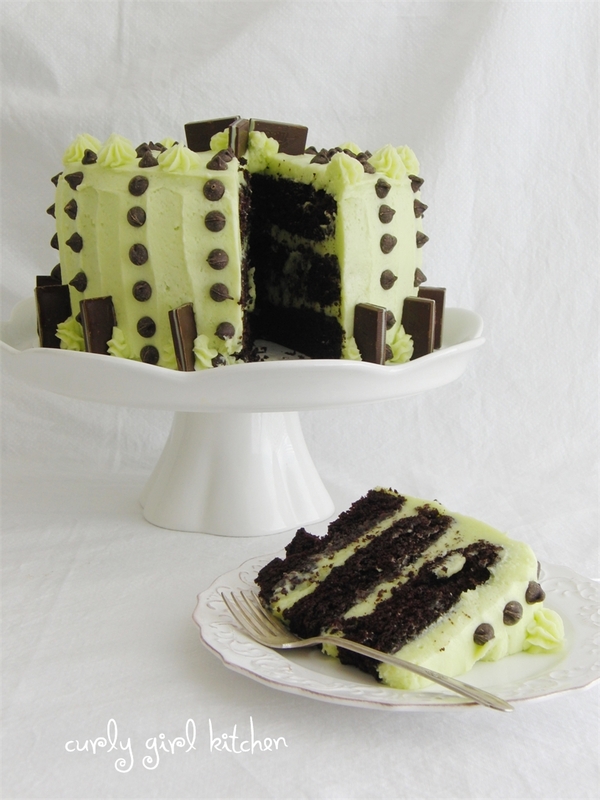 Decorate the cake by piping swirls of buttercream around the cake and garnishing with chocolate chips and Andes Mints.